Sensors, detectors, and imaging technologies and systems for a wide range of uses were advanced in presentations and exhibits for the nearly 5,000 scientists, engineers, product developers, suppliers, and program managers at SPIE Defense + Commercial Sensing last month in Baltimore, Maryland. Sponsored by SPIE, the international society for optics and photonics, the 2017 event will be held in Anaheim, California, 9-13 April. Sensing, imaging, and detection technologies for defense, commerical and scientific applicaitons were advanced at SPIE Defense + Commercial Sensing 2016. Plenary speakers Bradford Tousley of DARPA and Patrick Carrick of HSARPA spoke to an audience of more than 800, detailing progress in programs modernizing defense and security capabilities enabled by photonics. Sensors and imaging systems for detecting explosives, helping automated systems “see” and “taste”, and protecting intellectual property, and infrared cameras for the consumer market as well as for greater safety in public spaces were among imagination- and attention-grabbing applications featured last month at SPIE Defense + Commercial Sensing in Baltimore. Nearly 5,000 scientists, engineers, product developers, suppliers, and program managers filled the Baltimore Convention Center 17 through 21 April for the annual international conference and exhibition sponsored by SPIE, the international society for optics and photonics. Attendance was up by several percent for the technical program, which included more than 2,000 presentations organized into programs on Defense + Security and Commercial + Scientific Sensing + Imaging. Seven new conferences debuted, among a total of 56. John Rogers of the University of Illinois at Urbana-Champaign detailed work in developing electronics that have physical characteristics of human skin: they are thin, light, stretchable, and water-proof. Lori Lepak of Phoebus Optoelectronics reported on research done with City College of New York on improving biosensor performance and practicality, allowing for rapid, on-site detection of toxins and pathogens, monitoring food safety, making medical diagnoses, and detecting explosives. Simon Blackmore of the National Centre for Precision Farming at Harper Adams University reviewed advances in robotic agriculture and precision farming, sharing a vision of farming that incorporates lightweight robotic “farmers” capable of planting seeds in fields even at full moisture capacity, without compacting and damaging the soil. Sabah Jassim of the University of Buckingham presented on a new tool designed to assist biologists in Alzheimer's research, using an automated system to count and classify blood vessels in the hippocampus, the region of the brain primarily responsible for memories and navigation, and one of the first regions to become damaged during the onset of the condition. Anna Mignani of the Istituto di Fisica Applicata "Nello Carrara" showed results of using spectroscopy in analyzing food content, to virtually “taste” and assess for quality at point of purchase, monitor browning of meat or fermentation of wine or beer, verify milk quality, and calculate acidity and fatty acid profile of olive oil. More than 60 new products were announced by some of the 360 companies in the exhibition, and demonstrations of new applications were presented by companies including FLIR, DRS Technologies, and IJK Controls . High-definition-format midwave detector from Sofradir – celebrating its 30th anniversary -- for imaging equipment in airborne, naval, and ground vehicles to achieve longer range, wider field of view and better resolution. An expanded industry program ran throughout the exhibition’s three days with speakers including DARPA Director of Microtechnology Office William Chappell, IMEC Business Development Director Maarten Willems, and other industry leaders. More than 200 engineers and scientists attended courses in the suite of 26 offered on fundamental and advanced topics in sensors, imaging, data fusion, infrared cameras, and optical technologies. Symposium chairs were David Logan of BAE Systems, and Ming Wu, University of California, Berkeley. Accepted conference proceedings papers will be published in the SPIE Digital Library within a few weeks after the meeting. 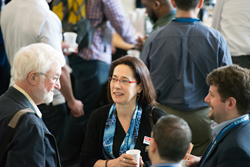 SPIE announced plans to rotate the meeting among three cities, to better connect with regional photonics communities. Next year’s meeting will be held 9-13 April in Anaheim, California, followed by Orlando, Florida, in 2018, and a return to Baltimore in 2019.